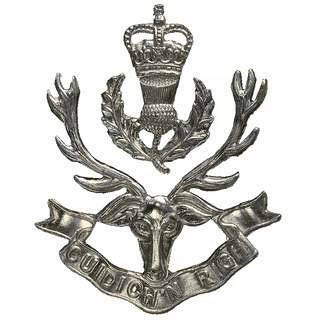 History Page: Regimental history of the Queen's Own Highlanders. The Queen's Own Highlanders were formed in 1961 by the amalgamation of the Seaforth Highlanders and The Queen's Own Cameron Highlanders. The Regiment recruited from the six Northern Highland counties, the Orkney islands as well as the two main Scottish cities of Glasgow and Edinburgh. I am a Glaswegian, as were many others in the Regiment, which rather surprised me when I got there! Known as the family regiment it had many brothers, father/son and other relations who joined. My uncle Frank McIlwham and brother Michael served with the Regiment, and both became Drum Majors of the 1st Battalion. We were an excellent Regiment, and we still span the globe. I can confidently state that no matter where you go you will find us, or more to the point, one of our offspring! None of the histories that follow can hope to include more than a brief overview of what each regiment did or achieved. Should you wish to know more about their histories, then please buy the books available from the SALES page. You can find us at RHQ in Cameron Barracks and the Regimental Museum at Fort George, which is open to visitors situated by Inverness. Well worth a visit and donations are gratefully received! Shortly after the Regiment was formed it was on active service in the jungles of Brunei and Borneo. It was this campaign that finally led to the present set-up of the SAS (Special Air Service) simply known as "The Regiment." Ever since the end of World War 2 the powers that be in the war office were finding it increasingly difficult to find a role for the SAS, (Much as the Parachute Regiment is today) and slowly but surely reduced their numbers to until only a reduced Territorial Army Unit sharing facilities with others was left. The jungles of Borneo were an ideal place for small four man patrols and the SAS thrived in that environment. This success was much due to the other Regiments serving in that theatre, the Queens Own Highlanders, and the Gurkhas. With the SAS supplying vital intelligence (and carrying out their own operations) for these Regiments Borneo & Brunei were very successful campaigns, in the hardest theatre of war, JUNGLE! See: Borneo Page It is no easy task for a soldier to enter any jungle without considerable training, and the SAS along with the help of local tribesmen (Ban) have been training there ever since. It was because this campaign was such a great success that the SAS hierarchy argued and won their case to increase the role and scope of the SAS. Combined with the break-up of the old Commonwealth and British Protectorates like Aden etc., the SAS were never again short of somewhere to display their individual and unique talents. Desert & Jungle, training ground and constant theatres of war for the Special Air service, I wish them all well, and continued success in their fight against the evil doers of this world. It has also occurred to me, since I was thinking of local tribesmen, that members of the regiment have been left dotted all over the world. One red haired member of my own Platoon, (Signals) was so taken by the Iban, and they to him, because of his hair colour, that he went back there to live in a Long Hut when he retired. He is still there today, at least as far as I am aware. Everywhere we have served members of the Battalion have returned to marry and live their lives. I am sure this must be true throughout history and different regiments but it is why, no matter where you go in the world today, there will be some Jock asking how you “Hau’s it goin”, and what’s happening back home, or for the score with Rangers or Celtic! I have digressed again. We served all over the world, including Berlin in Germany (as well as other towns/cities in that country), Persian Gulf, Falklands, Hong Kong, Edinburgh, Tidworth, numerous tours of Northern Ireland, including Operation Motorman (taking down of no-go areas), Belize (more jungle), and the Gulf War. This is just a small snapshot of what the Queens Own Highlanders are and where they served. Should you wish to know more, various books are available; see our Sales page for details! Equally if I have got it wrong, do not hesitate to contact me with corrections. If you have something you would like included, story, photo etc. get in touch. I hope to hear from lots of ex-members and that this web site will grow with your memorabilia. More content has been added and the site was usually updated on a weekly basis until we faded away in more amalgamtions and reorganisations!